George notes that this quotation appears in Dickens’s David Copperfield; however, the print predates the publication of the novel (1849-50) (87). Seymour’s relationship with Dickens may have some bearing on the source of the quotation. The lower left-hand corner of the print bears the signature, “Shortshanks fecit,” and the lower right-hand corner reads, “pub. by E. King, Chancery Lane.” Below the print is an explanatory key. It is probable that Shaving by Steam originally circulated as an independent, inexpensive print. New steam engine technologies in the early nineteenth century, including the invention of the locomotive, launched rapid technological and industrial change in Britain. Satirists and caricature artists such as Robert Seymour responded immediately to these changes, often highlighting the destructive and dehumanizing potential of these new machines (cf. J. Wosk, Breaking Frame). Shaving by Steam closely resembles an earlier unattributed print, a copy of which is also held by the Lewis Walpole Library: “Representation of the NEW SHAVING MACHINE whereby a number of Persons may be done at the same time with expedition ease and safety, Manufactured and Sold by D. Merry and Son, Birmingham,” dated 1794 by Wosk (97). The machinery appears similar in both prints, though Seymour has replaced the man-powered wheel with state-of-the-art steam technology. Seymour also makes apparent the violence implicit in the earlier print, in which a large-nosed man looks warily at the approaching machine while the text below assures the reader of its “safe, smooth, and efficacious manner” of operation. Wosk, I believe rightly, identifies this earlier print as satiric rather than as an actual advertisement; however, it is more ambivalent about the specter of “portrait-making mechanism[s]” than Seymour’s later version (98). 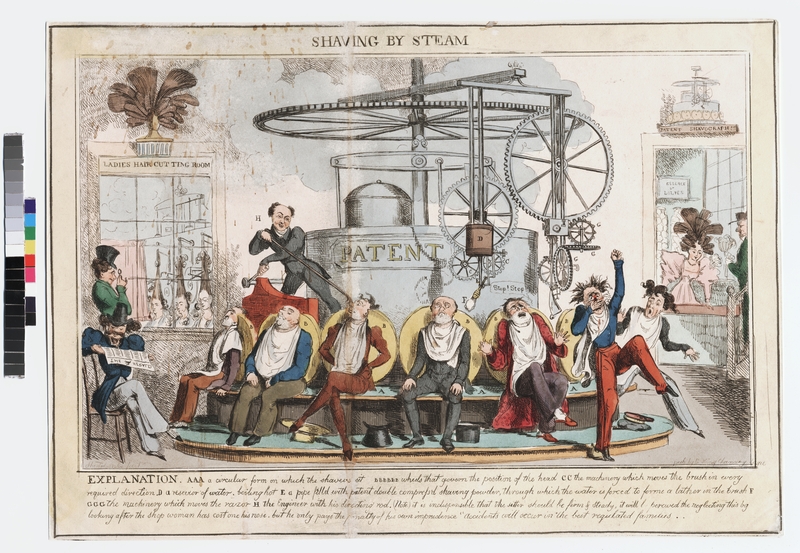 This detailed print satirizes new steam technologies and social types by depicting an imaginary, steam-generated shaving machine: in the image, customers are groomed by this complicated and dangerous piece of equipment. One unfortunate customer who cannot remain "firm and steady" after being distracted by a fashionable "shop woman," "pays the penalty of his own imprudence"—his nose is chopped off by the machine's blades. Seymour’s print also satirizes social types as well as technological mechanism, and the various figures are stereotyped by their clothing, their expressions, and especially by their hats. The two men waiting their turn on the left side, for example, are identified as dandies by their top-hats and dainty postures. Robert Seymour (like George Cruikshank, Robert Cruikshank, and Theodore Lane) is a significant figure in Romantic-era British caricature, and his particular fascination with technology reflects Romantic anxieties and ambivalence concerning the meaning of these new industries. Of particular relevance to this gallery is Seymour's concern with the ways in which new technologies radically alter the human body and self-identity. In Shaving by Steam, Seymour’s “shavograph” is both fascinating and terrifying, not only in its power to maim with just a slip of the blade, but also in the implied, symbolic threat of castration. Unlike the earlier print The Shaving Machine (which this one appears to reference), this print is quite explicit about the dangers of the beauty machine for its large-nosed customers. In the mixed-gender setting, voyeuristic opportunities abound, of which the dandy to the left takes full advantage, leering at the women in the next room through an eye piece. However, it also causes one unfortunate customer who cannot remain “firm and steady” to “[pay] the penalty of his own imprudence.” Caught in the unstoppable mechanism, the men are rendered, at best, impotent and ridiculous (Wosk 96). Wosk’s discussion of this print follows her discussion of automata in a chapter titled “Art, Technology, and the Human Image” (67-104). In her view, a machine like the “shavograph” threatens to depersonalize its individual subjects, rendering them duplicates and replicates (like clockwork dolls); hybrid, machine-human monsters; or horrifically disembodied. However, I would add that the typology of the print (a significant modification of the earlier print) also suggests that the dandification of fashionable men has already rendered them effeminate, impotent, and identical, a process that the “shavograph” comically expedites. As such, it bears some similarities to Robert Cruikshank’s The English Ladies Dandy Toy. From either perspective, Shaving by Steam exemplifies the conflicted Romantic interest—at once attracted and horrified—in how automated mechanisms double, fracture, and alter individual, gendered bodies and subjectivities. Bryant, Mark and Simon Heneage. “Robert Seymour.” Dictionary of British Cartoonists and Caricaturists 1730-1980. Aldershot: Scolar P, 1994. 196-197. Print. Everitt, Graham. “Robert Seymour.” English Caricaturists and Graphic Humourists of the Nineteenth Century. How They Illustrated and Interpreted Their Times. 2nd ed. London: Sonnenschein, 1893. 208-234. Print. George, M. Dorothy. “15654: SHAVING BY STEAM.” Catalogue of Political and Personal Satires Preserved in the Dept. of Prints and Drawings in the British Museum. Vol. 11. 1828-1832. London: The British Museum Board of Trustees, 1954. 86-87. Print.